Thanks to Mystery Friends for hanging out with us in the studio this week! We need your help supporting WERA 96.7FM, a big supporter of the local music scene in DC, & the station where the live version of our show airs! Arlington County is planning to cut funding for the station by 20%, which would gut the station staff, drive up costs to the station’s community considerably, and potentially even cause the loss of the station itself. 1) If you live in Arlington, or know someone who does, forward them this link and sign our petition - Urging the County Board to restore AIM's funding. Mystery Friends is a band rooted in the DC-music tradition while forging its own path forward. Since forming in 2016, the band finds its sound from a variety of influences, but they all fit together like a weird, wonderful puzzle. The band has been likened to Chvrches and Talking Heads, among others, but never looks to copy someone else’s sound. Combining powerful vocals, angular guitars, woozy synths, and a funky rhythm section, Mystery Friends makes moderately danceable rock music for a time when people need a reason to dance. 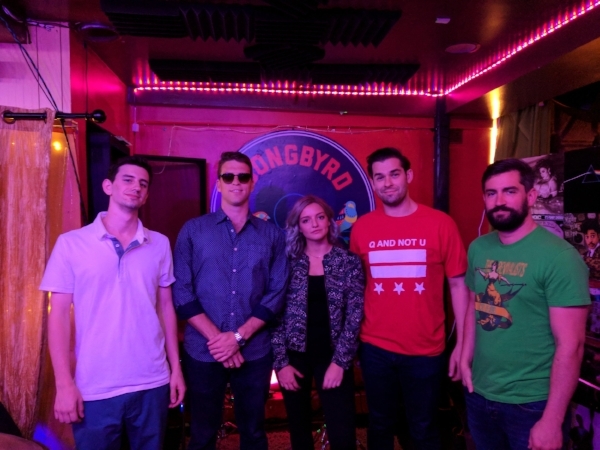 Brian: On DC Music Rocks we're shining a spotlight on the great songs, artists, and incredible people behind the DC region's local music scene. Mystery Friends formed in 2016 and finds its sound from a variety of influences that all fit together like a weird wonderful puzzle. The band has been likened to Chvrches and Talking Heads among others and combining powerful vocals from Abby over there with angular guitars, woozy sense, and a funky rhythm section. Mystery friends makes moderately danceable rock, which we established means only extreme dancing sometimes, regular dancing other times. Moderately danceable rock I love it. Moderately danceable rock music for a time when people need a reason to dance. So and I first came across these guys, God it was probably a couple years ago. I've been following you guys for a long time since the first EP came out and I've been such a fan so for me it's a fanboy moment for me where I get to say thank you guys so much for being here. This is really cool. Brian: Absolutely. Now so for those folks who haven't heard it what is it that makes you guys special do you think? I hear all the time that like, "Oh we have great energy." Or something but what else, what makes you guys special or different you think? Brian: And if they don't know what a reverse guitar is what is that exactly? Danny: That's a guitar that you play backwards and put it into a sample pad. Brian: Play backwards meaning upside down and in your left hand? What does that mean? Danny: Yeah well that's what we tried it first. Dave: So yeah I mean I would say part of what I think makes us unique or special would be that we take, we're a band with many influences and many, we bring a lot of different things to the table and that's could be a detriment but I think it's actually an asset because you know none of us are of the same exact musical taste and I think that ultimately that means we have like we try to write in that you know summary the combination can be interesting. You don't hear a lot of things like that because we're not all going from, "Oh I have to play like Radiohead. I have to play like whatever." Everybody has a different influence so therefore those are all represented in the music we ultimately produce. Brian: Got it and how did you guys come together? Danny: Very slowly. So I think actually the way that the name kind of works for us is that we all, so me and Dave went to high school together, but I met Robbie through his now fiancee. I met Abby through my girlfriend Kate's friend's sister. Is who Abby is. And I knew about Abby moving to DC months before she actually did and you know kind of probably scared her at a party one time when I told her I put a track on the playlist of the party that we were at. And so we kind of, yeah, so we kind of come from everywhere. Brian: So in it, but what I'm collecting from this is that you all some how knew each other a little bit it wasn't like a Craigslist thing? Dave: Who was Robbie with? Danny: I met his sister at a wedding. Danny: And we needed a drummer. Brian: You found someone at a wedding. Brian: I love this combination. Holy smokes. I can't even keep track of all the things you just said but at the same time the level of connections it's like three degrees of separation from what's his name? Kevin Spacey? Abby: Someone's connected or yeah well connected. If they're capable of something. Brian: That's amazing. And the name itself where does Mystery Friends come from? Brian: Now wait were you all like sitting around the name generator together at a rehearsal or did somebody find it and was like, "Hey what about this?" Abby: It was one of those rehearsals were I think we were let's rehearse but then it ended up being let's just eat pizza. So yeah I think there were instruments there but I don't think you can call it a rehearsal. Brian: So you had your phones out and you were looking on name generators and oh Mystery Friends. Abby: Yeah. It might've been Robbie. Yeah I don't, we had a list of like reject names and I think Mystery Friends was actually listed there and I'm like wait a minute that actually works for us. So you know all the odd connections and the friend tree that we have of how we all kind of came together so it worked out well. Brian: That's amazing and re-introduce yourselves real quick one more time. It's your name and what your role is in the band. Run through it for me real quick. Abby: Yeah Abby I'm the vocalist and the synth player. Dave: I'm Dave and I play guitar and synth and other stuff. Danny: And I'm Danny I play guitar and sample pad. Robbie: Robbie here. I play bass. Brian: Greg [crosstalk 00:04:38] he plays drums. Abby: Greg on the drums. Dave: Yeah on behalf of Greg he plays drums. Brian: On behalf of Greg. Robbie: The most mysterious of all the friends. Brian: Yeah I was going to say and I'm a drummer so you're the most important part and I love you man. Just so you know. Dave: Oh yeah. I can attest we tried playing without a drummer and I can attest that it is not as good as it sounds. Brian: See now you're just sucking up to me. Don't stop. Don't stop. That's so good. So now talk about you guys outside of the music. So then on the personal side, all of you guys, what are your hobbies? What do you do outside of Mystery Friends? Abby you first. Abby: Well it's funny because we all kind of have our corporate work jobs which kind of consume but we still find time for the band and for other things and yeah I'm really heavily involved in the events. You know industry out here in DC so I'm working a lot of events and going to a lot of events. Brian: Nice. What kind of events are your favorite kind of events? Abby: I, this is so cheesy but I love weddings. It's just, I cry at every single one of them. Robbie: Even though she's missing mine. Abby: We're gonna do that right now aren't we. Brian: That's a shot over the bower. Alright. Abby: That's just [crosstalk 00:05:43]. Brian: He was waiting until now to do that. He really was. Brian: Oh God that's hilarious. Alright Dave what about you man? Dave: So I am a also a tax lawyer. So that's less fun than music but it is what I do. Dave: Even for the synthesizers that I have. And then I also play, well I don't play so much baseball these days, but used to play baseball and now I'm auditing my [inaudible 00:06:05] shop because I'm playing music instead. Dave: And also Abby's being modest. She's also a successful solo artist and she just released a really cool video so you should check that out. Brian: Nice. And if they want to check out that video where do they go? Abby: It's on YouTube now and the official music video is up as of yesterday. Two days ago. Brian: And they should search for? Abby: Escape Plan by Abby Sevcik. And if you need help spelling that it's S-E-V-C-I-K.
Brian: There it is. Alright and so next up. What do we got? Danny: I don't do a whole lot. I program professionally so I spend a lot of time around a computer and then I go home and play video games on my Nintendo Switch. Brian: Fantastic. [crosstalk 00:06:42] top two video games? Danny: Top two video games right now are we talking? Brian: Yeah. Like if you were going home now what two would you likely play? Danny: Probably Breath of the Wild and Golf Stories the current one. It's an RPG revolving around golf. Brian: And if they don't happen to know what game system are those on? Danny: Those are on Nintendo Switch. Dave: You thought the tax lawyer was nerdy? Danny: I was kind of like, "You made a mistake there." Brian: Oh well if you guys want to compete you know I got, that's cool. Alright and now what else? Talk to me man Robbie what do you got? Robbie: Yeah so I'll follow up with the day job as we all have them. I'm a real estate agent so I spend a lot of time looking at houses and et cetera. In my free time me and the fiancee [Bria 00:07:27] we love to go outdoors. We do a lot of hiking and skiing all those types of things. Brian: And what's the latest outdoor thing that you've done that comes to mind? Dave: Yeah the destructive fire based outdoorsy. Brian: Oh my God that's like, I didn't know what I was expecting but I wasn't expecting that. And then we were just talking about the nerdy level of the other two guys and now, oh wow. It's so good. I love you guys. Now one of my other favorite questions that I love to ask is if you could offer one piece of advice and this is for all of you guys, I want you to answer, if you can offer one piece of advice what would it be? Abby you're first. Abby: I think the best piece of advice I've been offered that I often relay is don't ever get to a point where you feel like you made it. I think that there's a lot of little success that come about that you're like "Oh my gosh this is so cool." You know I think you can kind of level yourself off if you're not careful. So just always you know remaining humble but also reaching for the next level of whatever you just obtained. Brian: Yeah and just out of curiosity what's the most recent success moment that comes to mind for you when you say that? Don't let it get to you but what comes to mind for you? Abby: It's crazy 'cause I'm sure a lot of people have experienced but this was my like, "Oh my gosh I made it." Dangerous but somebody saw me off the street and was like, "Are you in that band Mystery Friends?" I was like [crosstalk 00:09:03]. And I didn't want to know 'cause I'm sure like that was probably a friend of a friend but I'm like no I'm just going to go ahead and assume that that was a complete stranger. Brian: I am so glad that that happened to you. That's amazing. Alright Dave you're next man talk to me. Dave: I would say don't be lazy. I think, you know, if this band has been nothing else but exercise and you try there's a good chance you might just succeed even when you don't think your qualified or very good and you might not be. But if you're willing to go for it. I mean we basically shown that just trying and asking and just going of rit can be remarkably successful and it's really easy to do nothing so if you have a passion for it don't be lazy. Go for it. Brian: Don't be lazy. Right. I like it. And what is, is music an example of where you weren't lazy or didn't be lazy? Dave: Yeah I would say so. I would say I don't think the band collectively is very lazy with music. I think the first couple months we played or the first six months we played. We probably were pretty lazy you know. We sat around and played and just kind of you know tried out some sounds and hung out and ate pizza and once we decided we're actually going to do it and put a focus to it and like spend the time and money to make it right it was you know eye opening how much you can go by just being willing to go for it. Brian: That's awesome. Very cool. Alright next up talk to us. Danny: I think I mean this kind of plays into what Dave was saying but it's always worth asking the question so I mean that's how we kind of got a lot of our gigs around DC was just saying, "Hey can we play here?" And reaching out to different people I mean I think we even reached out to DC Music Rocks at some point and we're like, "Hey you know I don't think we know you but we'd love to." So I really do feel like kind of, you know, it's kind of like the Michael Scott quote, "You miss a 100% of the shots you don't take." Yeah. Brian: Is it Michael Scott? I feel like everybody [crosstalk 00:10:45] has been quoted. So many people have been quoted saying that actually. I heard it so many times. It was Michael Jordan, [Gramsky 00:10:52] I mean there are so many. Absolutely. Charles Barclay I'm sure one day I said it. Danny: He said a lot of things. Brian: Oh my God that's amazing. Alright Robbie. You're up man. You're in here too get up here. What do you got? Robbie: Keep throwing me near the mic so I'll take one from some personal experience. I think that I spent a lot of time growing up around some very talented musicians and always felt that I would not be able to play at their level and that if I did try to play along with them that I would be wrong and one thing I've learned from the band and from a lot of reading that I've done recently is you know there is no right or wrong in music until you've defined it, right? So music is supposed to be a conversation and the only way to get better is to play with other people and you know if you're lucky you'll find people who are better than you like all these folks here that'll make you become a better musician. Brian: That's awesome. I love it. Alright keep exploring keep doing it. I love it guys. And for those folks who want to find out more about you guys and the cool stuff that's happening with Mystery Friends where do they go? Danny: Mysteryfriendsmusic.com. We're on Facebook at Mystery Friends. Mystery Friends on Twitter, Mystery Friends on Instagram. Dave: Technically Mystery Friends band on Facebook but everything else is Mystery Friends. Dave: Some reason somebody else has Mystery Friends that is not us. Brian: Go figure right. And it's not a Scooby-Doo reference? Dave: It's not a Scooby-Doo reference. Brian: There it is. Okay. Dave: But we will not be hopefully solving a crime. Dave: We'd get sued is the only [crosstalk 00:12:23]. Brian: Oh my God you're taking a band van. That's so good.